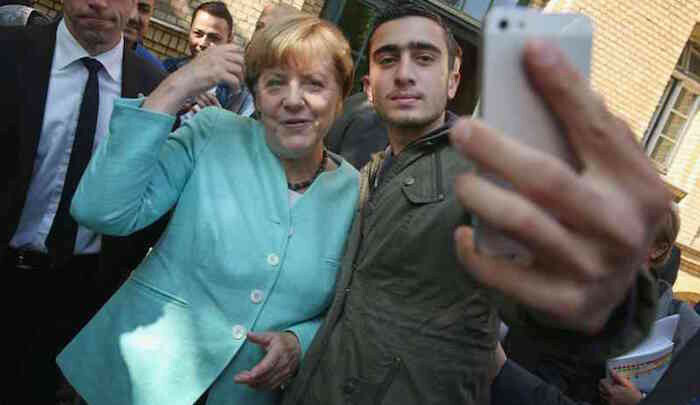 ASYLUM seekers in Germany are refusing to undertake work to counteract boredom – using Chancellor Angela Merkel’s generous hospitality as an excuse. The local council spent £600 arranging for the men to have uniforms but were stunned when they were told they would not complete it because they were “guests of Angela Merkel”. Mayor Pohlers said: “It was subsequently argued by these people that they are guests of Mrs. Merkel and guests do not have to work. “Furthermore, they were of the opinion that there is a minimum wage (€8.50) in Germany, and that this had to be paid by the City Waldenburg.” Despite attempts at mediation the asylum seekers refused to return to work. Mayor Pohlers added: “In a specially convened meeting with an interpreter the authorities explained the rules again. “Unfortunately, no agreement could be reached on the continuation of the measure.” Now all seven of the jobs have been scrapped. The mayor spoke out in a bid to highlight the issue of the asylum crisis in Germany. He said he is aware his statements could play into the hands of those opposing the mass migration. However after having raised money from the local community to help aid the asylum seeker’s transition into the community, he felt compelled to speak out…..
Stupid Germans. Arabs don't work. Never have. They own shops perhaps but they don't work. Every Arab state imports their work force from the 3rd world and their supervisory personnel from the 1st. They sit about all day smoking and drinking tea. That's all they do.